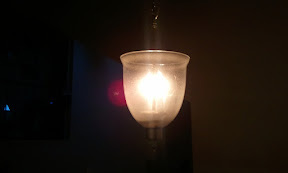 I picked up a large quantity of LED replacement bulbs, to cut down on electric use, and heat, on several lamps in the house. 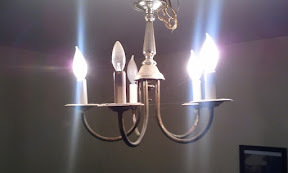 The left side above shows what the incandescent bulbs looked like before being replaced with LED bulbs on the right. 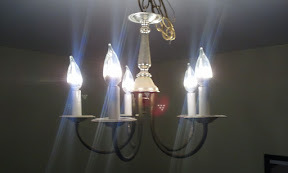 The first row has a chandelier with a couple burned out bulbs, so comparing the amount of light between the two is not quite equal. The LED light is nearly the same as before, and the main way to tell which picture is which, besides the former shot missing some brightness, is the triangular flare near the center. This was caused by the specific pattern the LEDs are shaped in on each bulb -- a bit of a pyramid within the pointed shape. 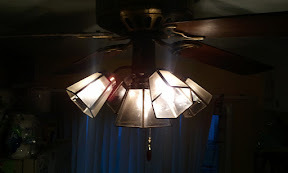 The second row shows the kitchen lamp, where one of the 5 incandescent bulbs was dead before the replacement. With the dark tint of each glass enclosure, this set seems a bit dimmer than before, but is still acceptable. The third row is a two bulb fixture. 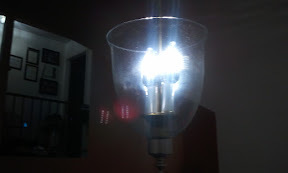 The center cylinder with the power cable, that is threaded for the glass stopper is almost too small for the LED bulbs, which only fit after slightly bending the socket. 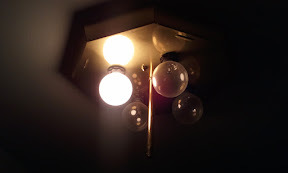 The incandescent bulbs that were replaced had a smaller diameter than the new bulbs. On the left is a flare from the Edison type filament, and on the right are two flares from the sets of parallel LEDs in each bulb. Because the glass enclosure is open to dust collection, the right picture appears much cleaner and clearer because I polished it. 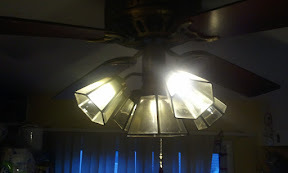 The fourth row is of the hall light that had 4 sockets, only one of which was lit by incandescent before the LEDs were put up. 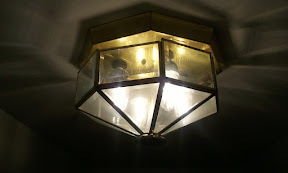 Unfortunately the old bulbs were small spheres, while the new ones are larger ovals that don't quite fit in the enclosure. I needed to let it hang there without being completely screwed in as it should be. Next time I'll measure the old bulbs. 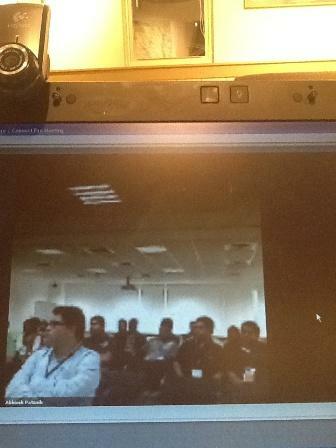 When Abesh asked me to present something at the SAP Inside Track event in India in December, I checked the calendar and realized not only was it during a camping weekend, the time zone difference meant it was starting around midnight for me, lasting until around 9AM the next morning. I said I would record a video for the "keynote" time period, and try to be online then so I could chat if possible. After a bit of thought, I decided to make a video with a number of segments, each around 30 seconds, and do "costume changes" between scenes. My original plan was 20 scenes, for a running time of 10 minutes; the final cut was perhaps 15 shots and about 8 minutes, 90 seconds of which was not actually me. I decided to set up a tripod, point the FlipCam (cheap high definition video camera, now obsolete due to the new owner cutting the product line) at a chair, so I'd be able to fade between takes. The part about pointing the camera at a fixed spot worked very well, only if I had to do it over I'd have come in for more of a close up. The resolution was fine, on the original shots, but the microphone didn't pick me up very well on some takes. I wanted to show different SAP related shirts (or kurtas) so I could not come in too tight, but getting more audio would have meant hooking up another microphone, adding production time to something I wanted to do quickly. I wrote up notes on the scenes and stories I wanted to tell, laid out a dozen outfits, and started shooting one right after the other. The first take was uploaded to YouTube, even though after watching it I realized the audio was too quiet. The bigger problem with the rendering of this clip was my choice of "WMV" format. While it looks and sounds okay, the video editor took a widescreen image and bent it to a smaller window. When uploaded to YouTube, there are black bars on the side, which should not be there, and I look thinner than I really am (like a fun house mirror). The other output formats did not have this issue, and I have not found a fix for the WMV format. When I play the file locally with VLC, there is a switch to widen the picture, which works fine. YouTube does not have this, as far as I can tell. Once I edited together the clips, taking out the time where I sat down or stood up, I wanted to have transitions between them. Again, the video program either did not behave, or I was unable to find the controls I had used in prior work to do fade in or fade out effects. With a short time window, I gave up on the video effects and stuck with sound bites only. To back up a minute, one thought I had was a sound track with music from India, whether tabla drum, sitar or something like that. But I definitely did not want to include any commercial or copyright sounds. Unfortunately, in brief (or not so brief) searches for drum clips, I found almost nothing free and unencumbered by copyright. I finally came across a site with sound samples that have been placed in the public domain. The coolest part of that was the site was "One Laptop Per Child" - a project I had read about, and contributed to in the past. 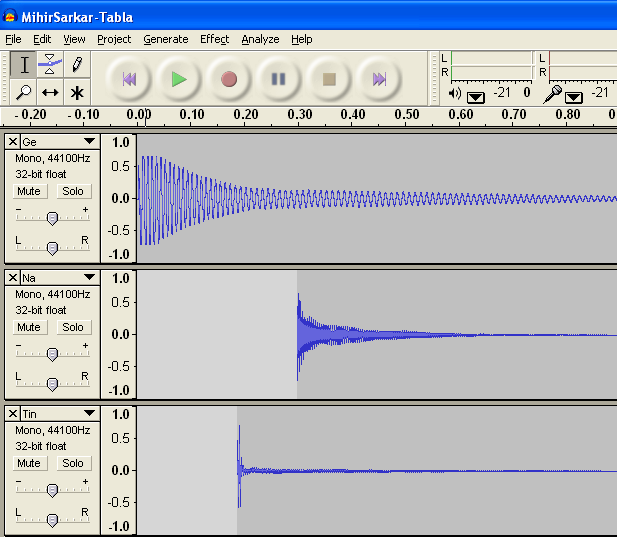 There I found information about tabla drum samples from Mihir Sarkar. The actual files are on archive.org, another place I have used, to get Grateful Dead public recordings, and view some old movie clips. Nice site! The page said "Sound samples by Mihir Sarkar recorded for Richard Boulanger for use in the One Laptop per Child music library. See http://wiki.laptop.org/go/Sound_samples for details." "Creative Commons license: Attribution 3.0"
While on a Thanksgiving weekend visit to the home of Marilyn Pratt, I brought along the FlipCam, intending to get Marilyn on camera for a dialogue about the community network and India. There wasn't much time to focus on this (pun intended) and I ended up leaving the camera for her to create a clip late in the evening. I took off early the next day, and while she left a note saying she recorded something, I didn't get a chance to see it until I got home (when it was impossible for any retakes!). Again, one take. Once spliced and mixed, I needed to render the file, which is always a challenge for me. So may options, some of which work well with YouTube, some of which don't work so well, and some of which don't work at all. And apparently, this spectrum changes more frequently than expected (another story). I decided to have Plan A be upload the entire high definition file with Dropbox, and Plan B be to use YouTube. The reason a file was Plan A was the possibility of internet failure at the event site. Assuming the on-location hosts were able to download the file, bad internet would not prevent the un-keynote from playing. Two problems cropped up right away. The first was download speed; Abesh was able to download the movie quickly, but he isn't in Bangalore or Kolkata. And as soon as one of the actual hosts began to get the file (which, unfortunately due to the render format I picked was over 1GB), my shiny new Dropbox account was suspended, initially for 3 days. I griped online via Twitter, and was given a reprieve very, very quickly, but even with that, only one of the two site hosts was able to get the file.